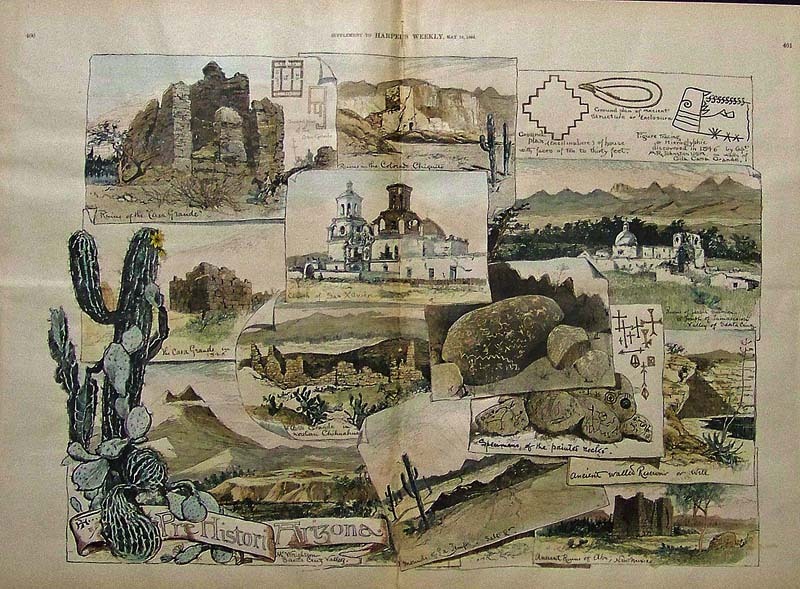 Antique Arizona Prints and Maps. 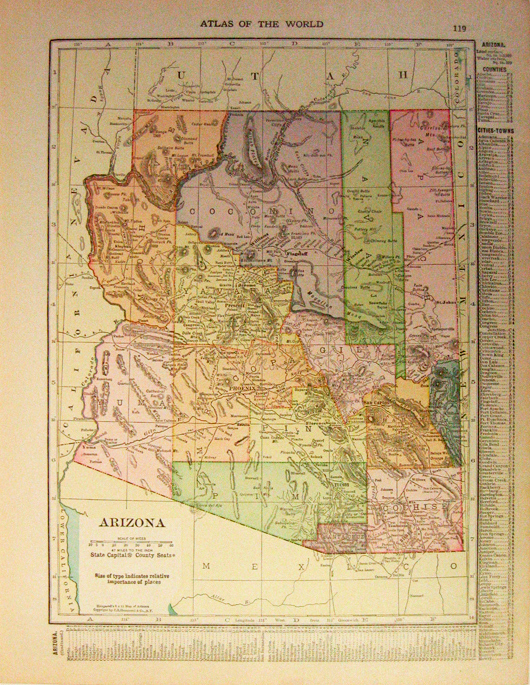 1891 Bradley's color map of Arizona and New Mexico from Bradley's Atlas of the World which shows the mountain ranges, counties, and other geographical details. 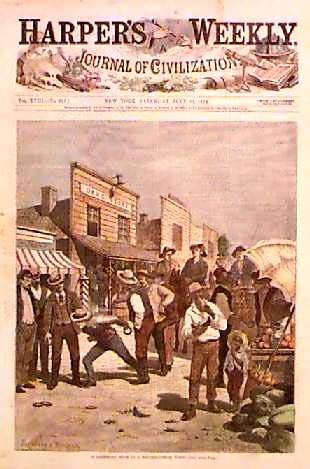 OLD SOUTHWESTERN TOWN-1874 PRINT. 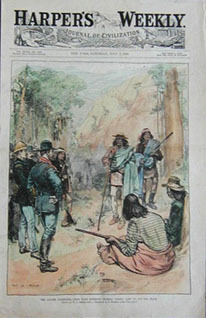 Authentic professionally watercolored engraving from the front page of original Harper's Weekly, published July 25, 1874. Entitled "A Saturday Noon in a Southwestern Town." 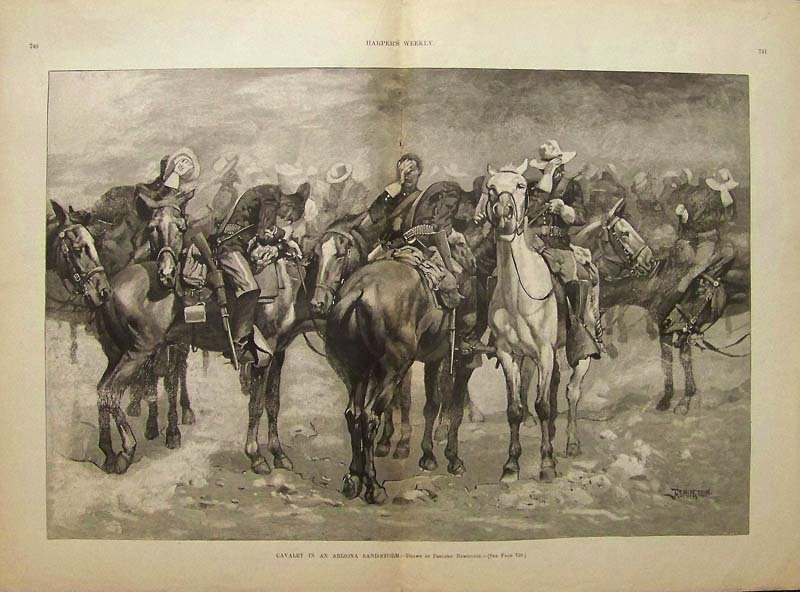 Drawn by Frenzeny & Tavernier, the great French artists who chronicled the west during the late 1800's. 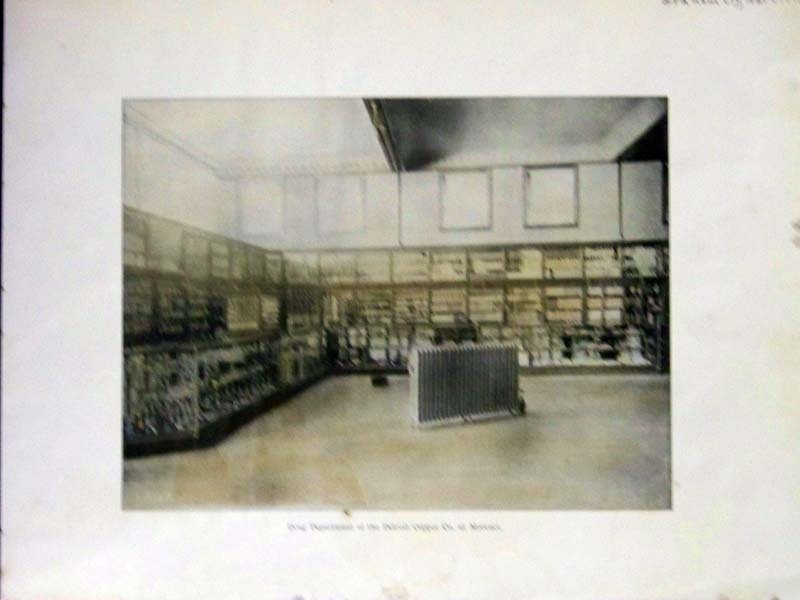 A genuine antique print produced in 1874, NOT a reproduction!. 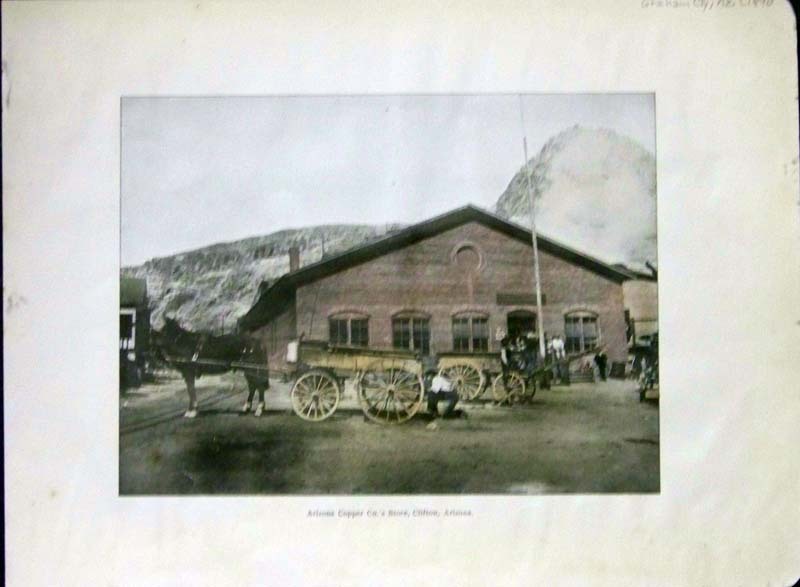 1890 Hand colored photogravure showing the "Arizona Copper Co.'s Store, Clifton, Arizona" in Graham County, Arizona. 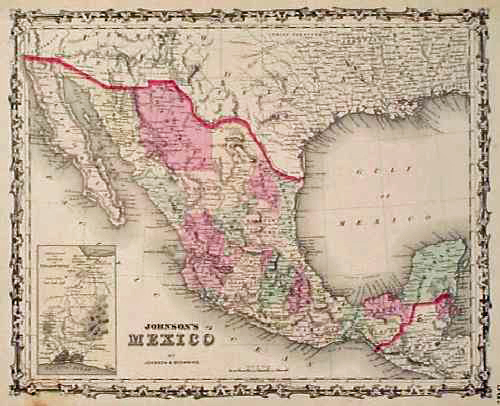 1864 Early Mexico Map. 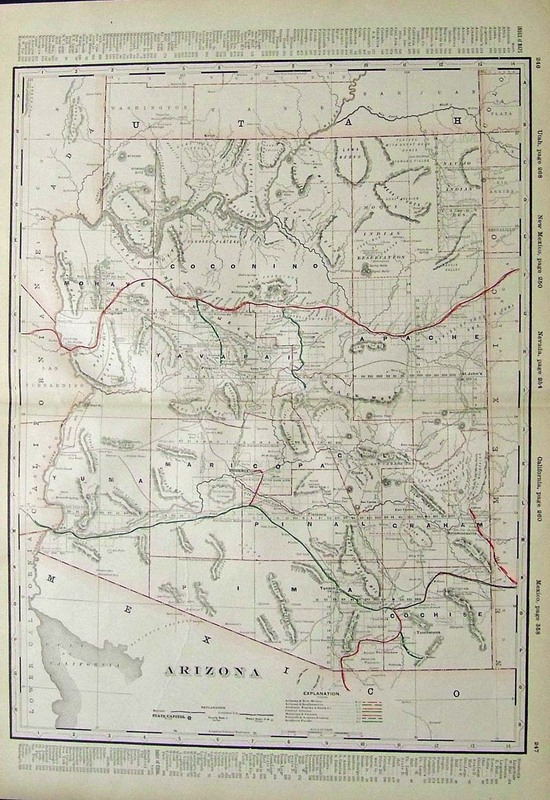 Early Johnson Map of Mexico and Southwestern Arizona. Arizona is below New Mexico Territory. 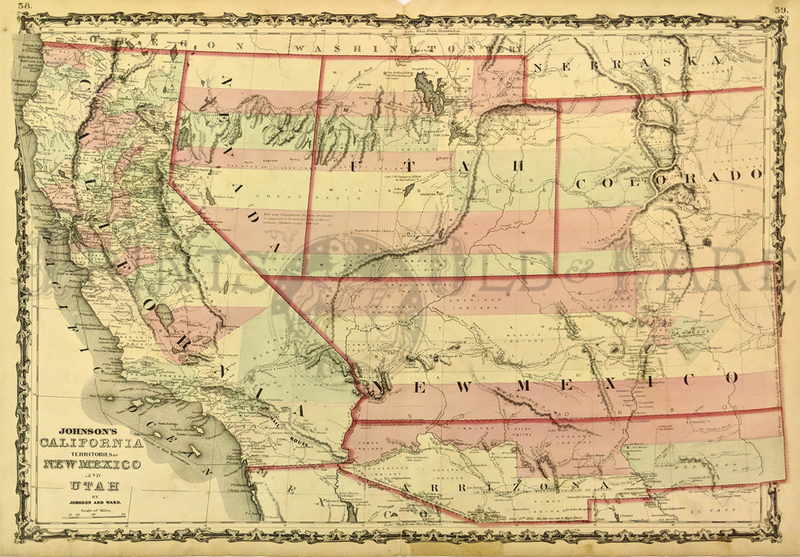 Hand colored collector's map. 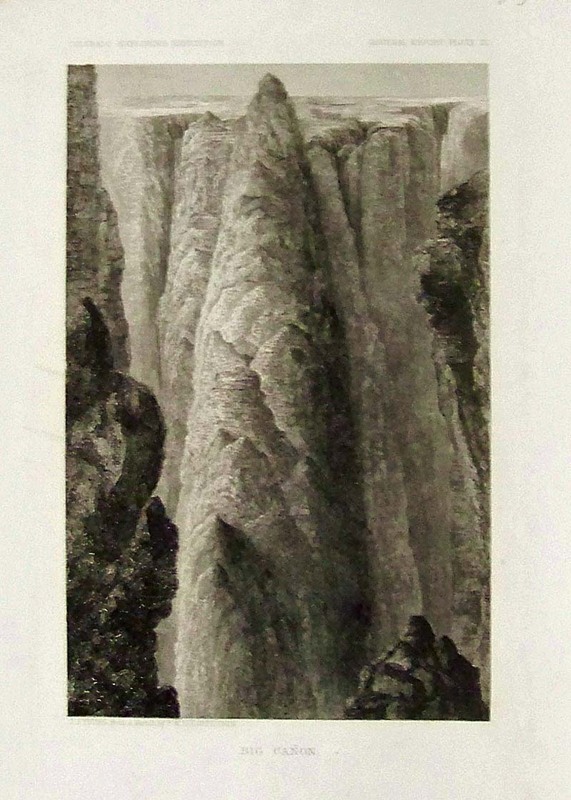 1850 Steel engraving featured in Colorado Exploring Exposition titled, "Big Canon." Big Canon is in the Grand Canyon. 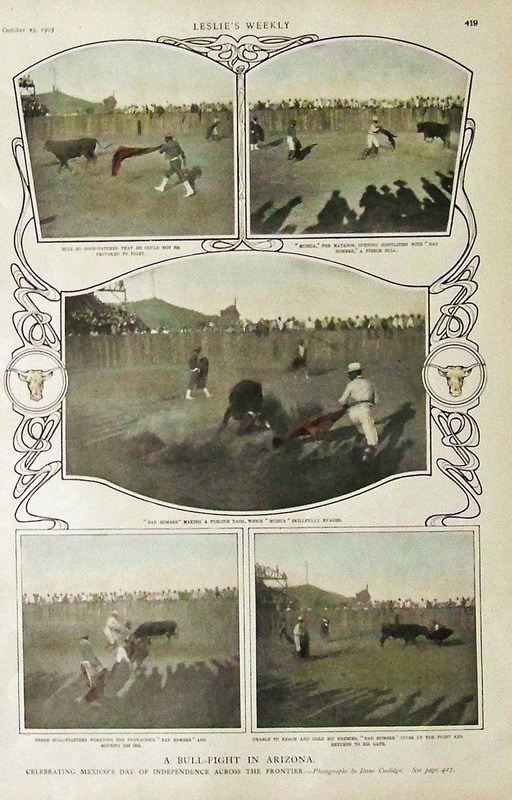 1903 Hand colored half-tone images showing A Bull-Fight in Arizona, celebrating Mexico's day of Independence across the Frontier. 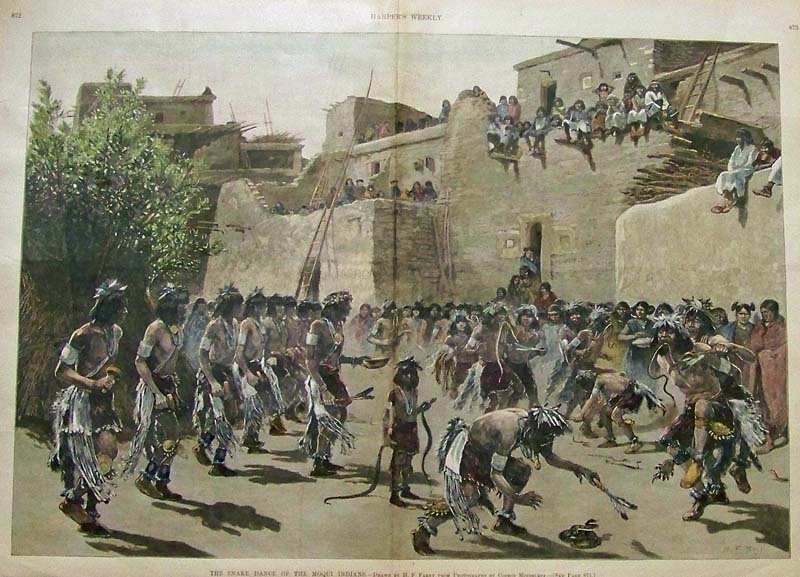 1889 Hand colored wood engraving titled, "The Snake Dance of the Moqui Indians." Drawn by H.F. Farny. Featured in Harper's Weekly and in fine condition. 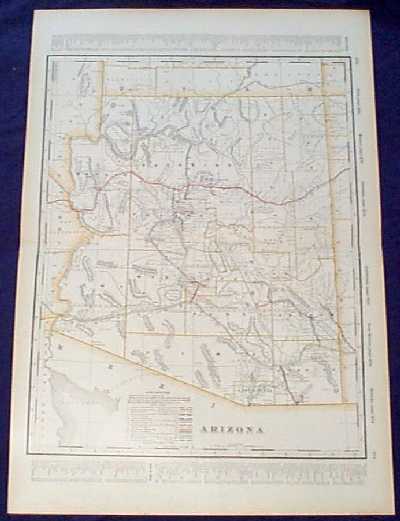 1894 Rand, McNally & Co. Arizona Railroads Map with key on bottom of map detailing the names of the railroads and their locations. 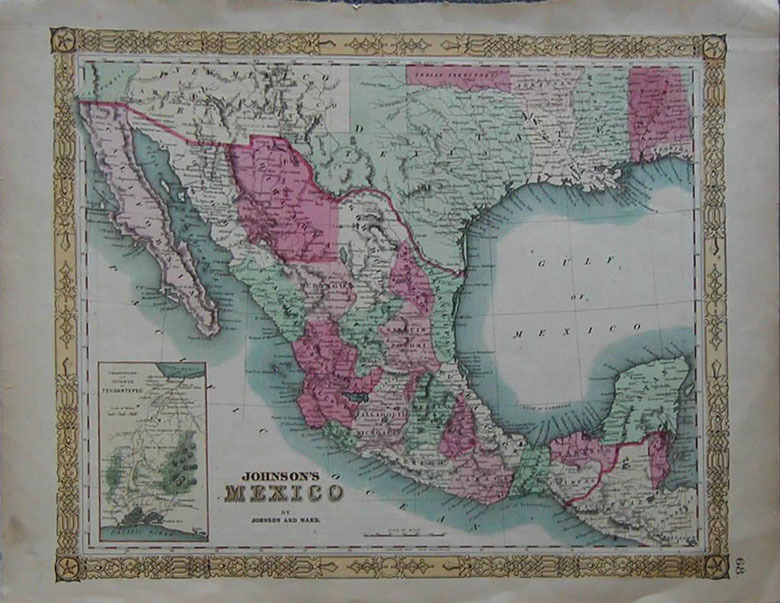 1861 Johnson Map of Mexico. 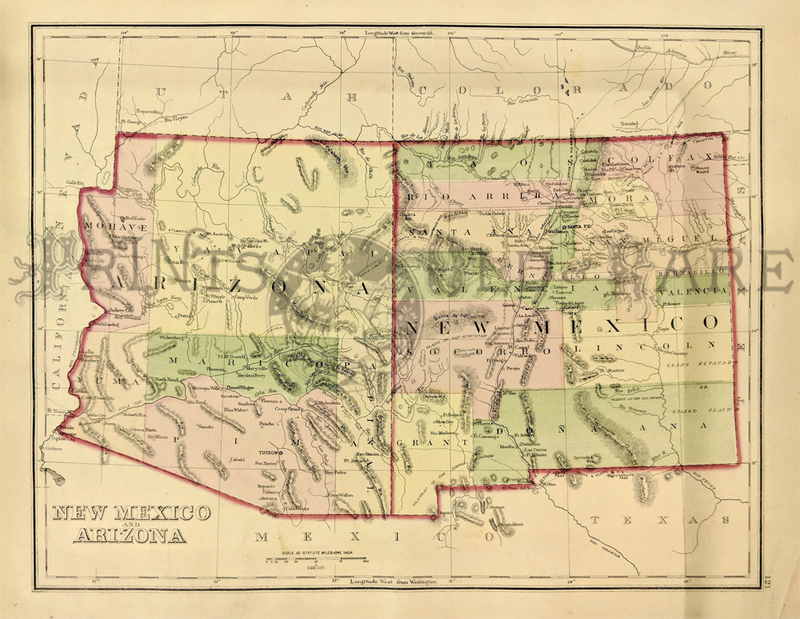 Beautiful, hand colored map with a decorative border, published while Arizona and New Mexico were newly acquired US territories. Above Mexico's northern border, Arizona is shown SOUTH of New Mexico, covering an area from California to Texas. Much of it is labeled as "uninhabited" territory. 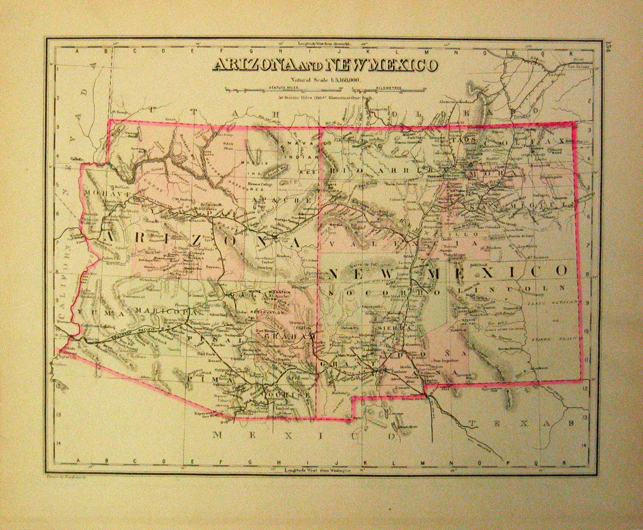 1895 Map: Arizona and New Mexico. 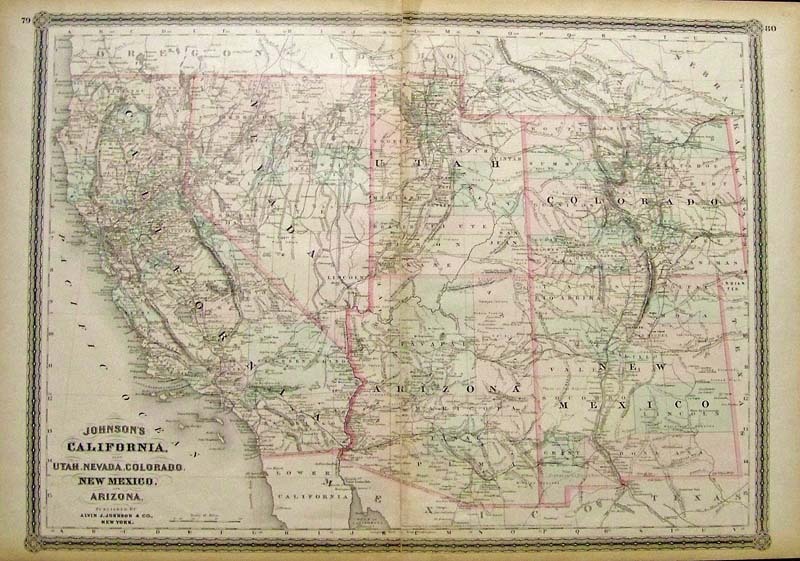 Colorful map of the two states, published circa 1895 by the National Map Company. Shows cities, towns, railroad lines, geographical features and Indian reservations. Each county is colored separately. 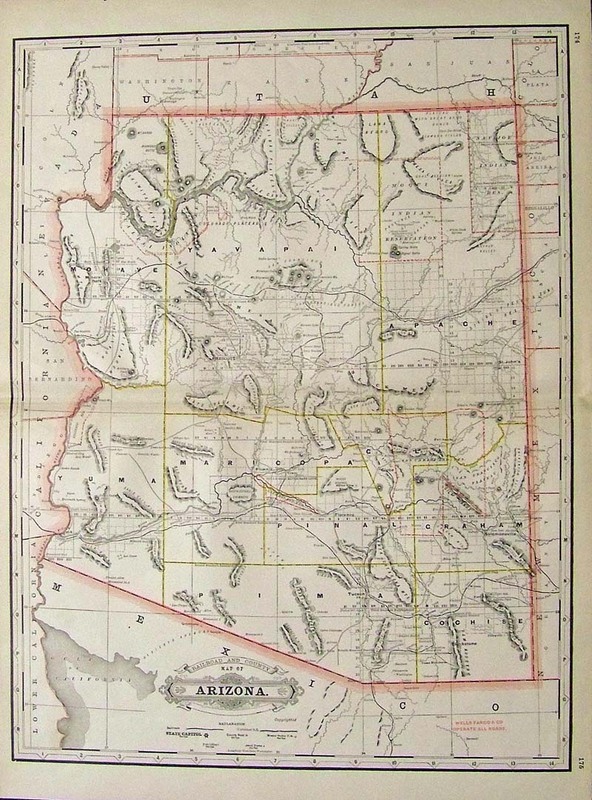 1881 Map of Tusayan Province, Northeastern Arizona. 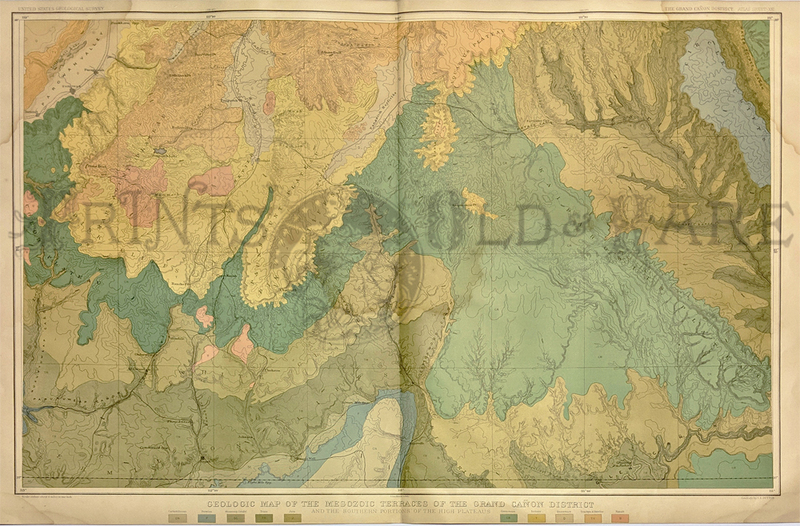 Lithographed, hand colored map published in 1881 by the US Geological Survey. Shows the locations of towns, roads, archeological ruins and gardens throughout the area. 1873 Arizona Canyon Scene by Thomas Moran. 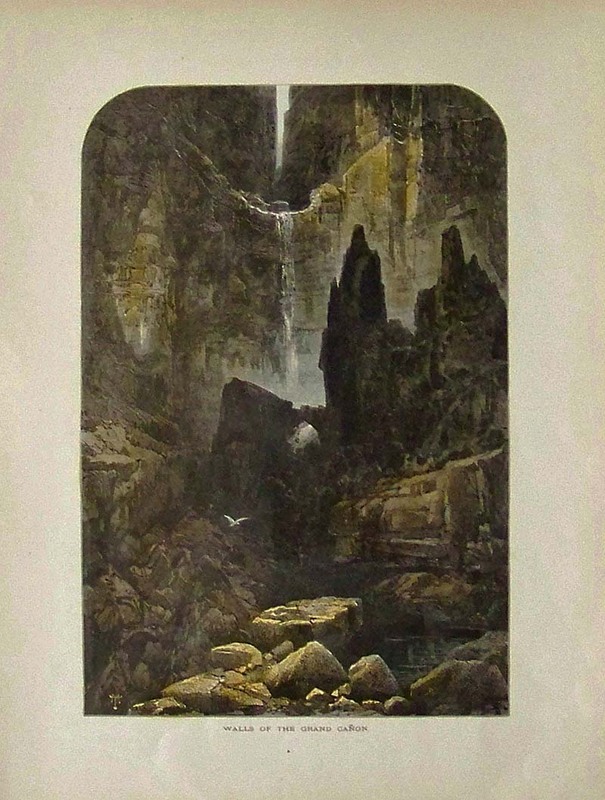 Beautiful, hand colored engraving by Thomas Moran, titled "Marble Cañon." Shows a view from the bottom of the canyon. 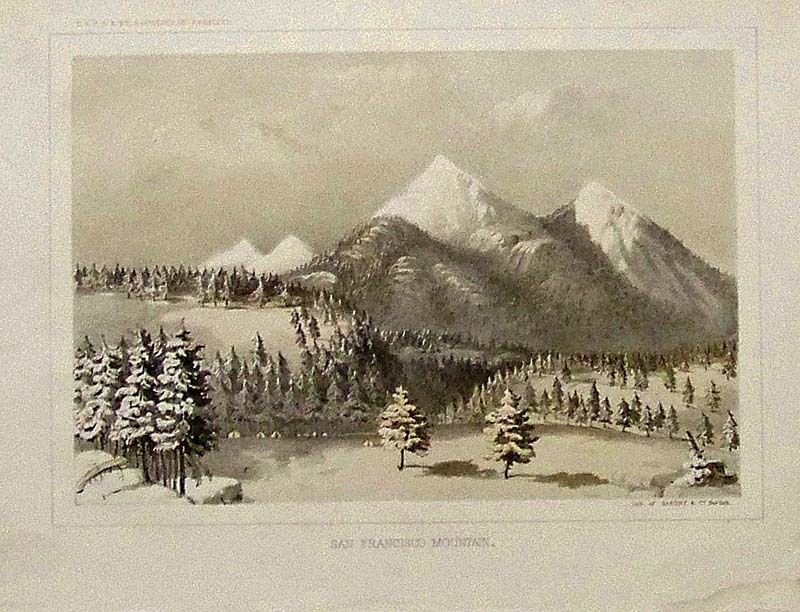 Published in Picturesque America, an 1873 book about American scenery. 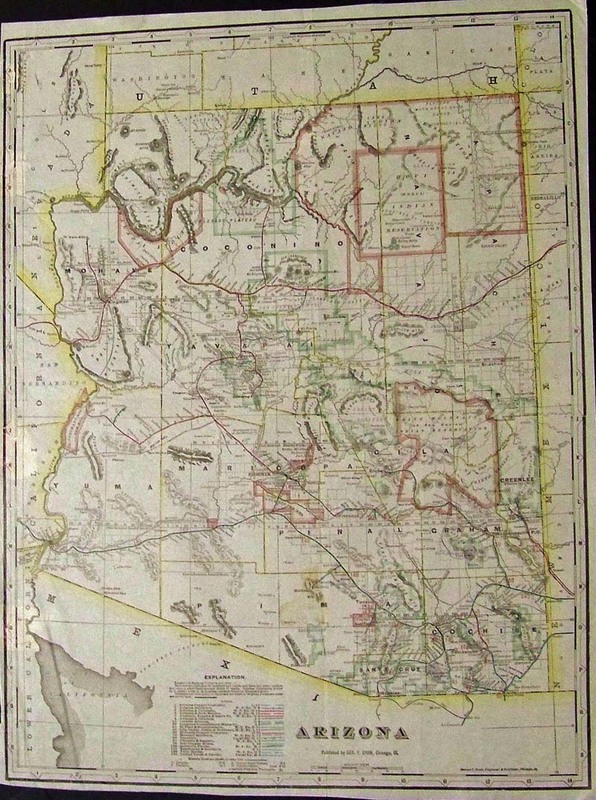 Detailed 1901 Railroad Map of Arizona. Beautiful map from the 1901 first edition of George Cram's folio-size world atlas. Color coded lines on the map show the names and locations of railroads throughout the state. State and county borders are outlined in yellow. Cities, towns, Indian reservations and geographical features are all shown. This map would look great in a frame! 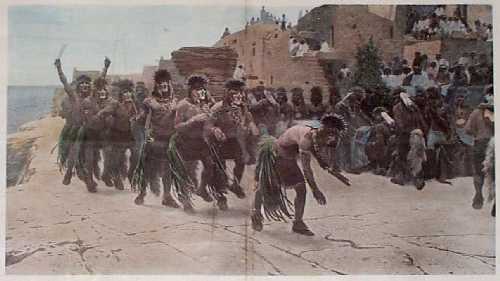 1895 Moki Indians Snake Dance Scene. 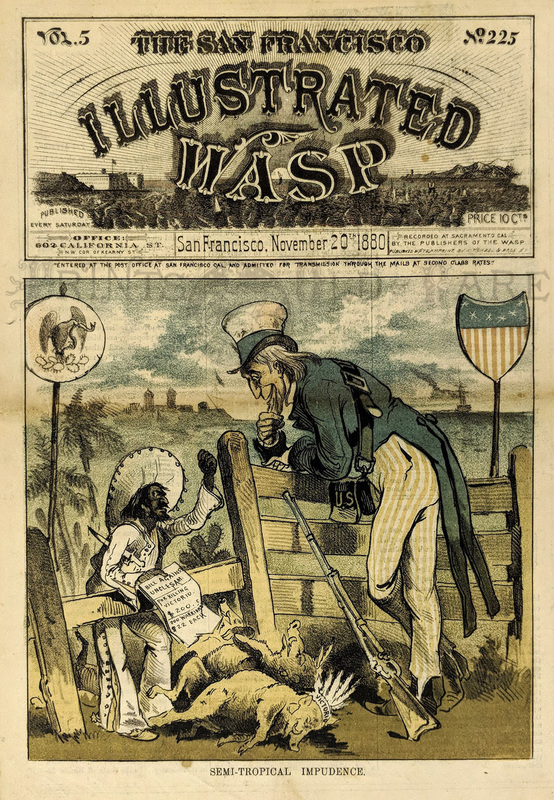 Hand-colored, from Harper's Weekly, circa 1895. Title is "Among the Moki Indians: The Snake Dance." Dancers are shown in single file following a snake which is on the ground in front of them. A professional repair has been made to a long vertical tear near the center crease, and it is barely noticeable. Overall fine condition. 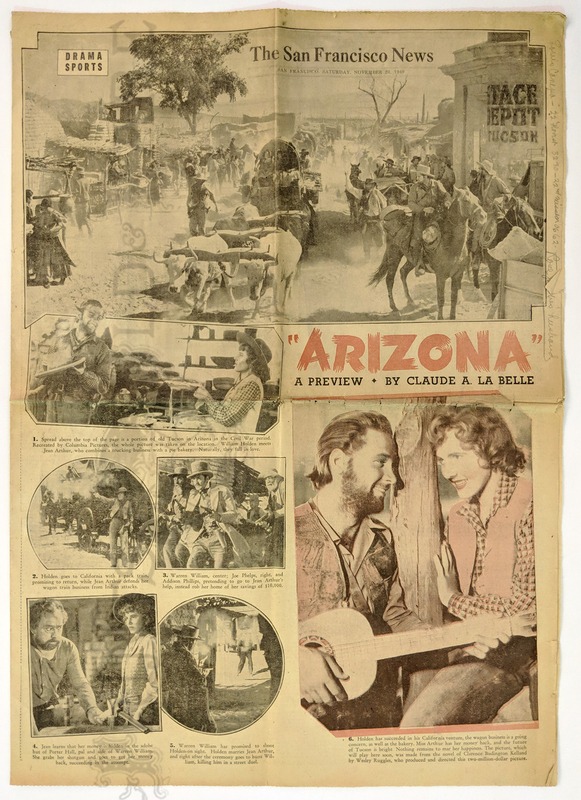 1940 “Arizona – a Preview” Movie highlights by Claude La Belle. 7 photos of William Holden + SF Chronicle Drama and Sports sections. 8pp. Inside Jean Arthur, Betty Grable, Charlie Chaplain, etc. Back page comics. 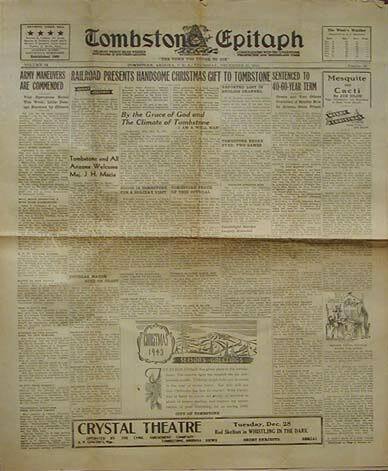 Dated 11/23/1940. 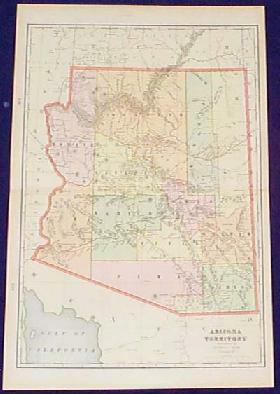 Gray's New Mexico & Arizona Map. 1875. Detailed map showing a number of newly formed counties and transitional borders in both states. Also shows cities, mountains, plains areas, rivers and creeks. Hand colored, lithograph. 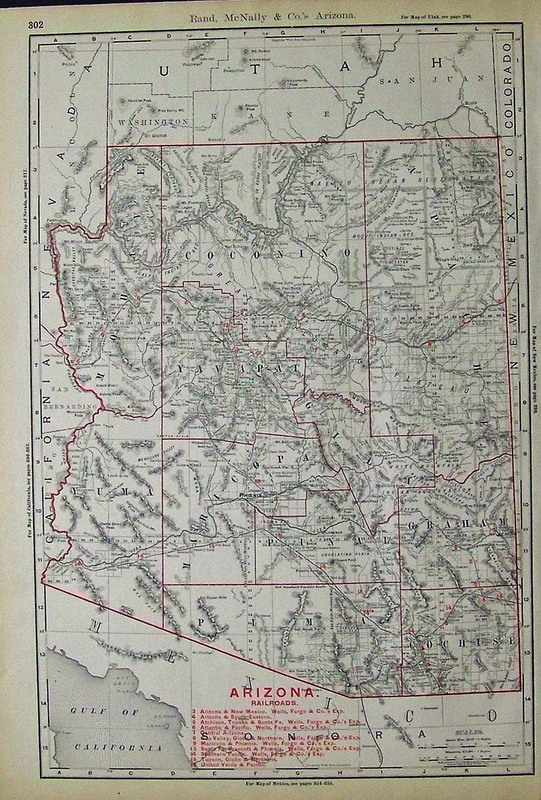 1892 Railroad survey map of Arizona. 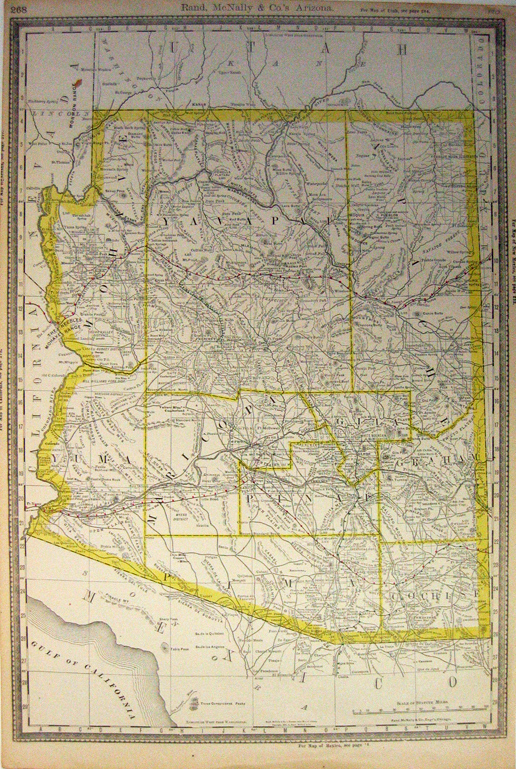 This pre-statehood map shows all of the township borders and meridian lines as well as mountains, rivers and Indian Reservations. The seven different railroads that pass throught the state are color coded and their routes shown with a key at the bottom of the map. 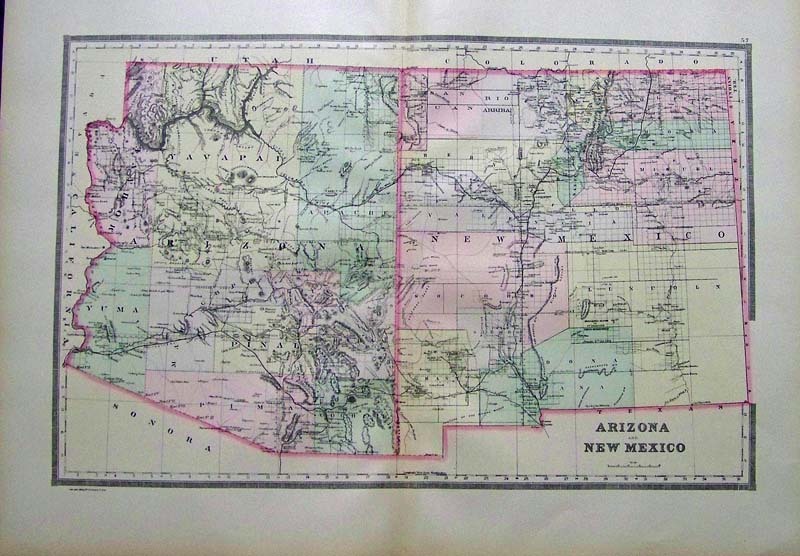 1888 Arizona Large color map by Rand McNally & Co. 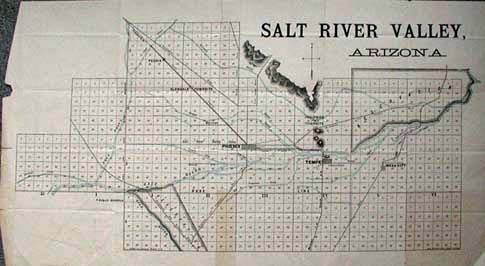 Very detailed map from the 1880s. 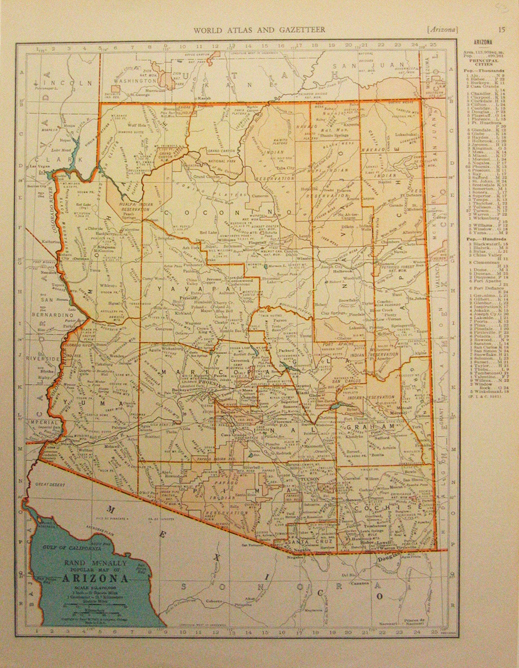 1943 Arizona map shown in color with a guide to principal cities from the World Atlas and Gazetteer by Rand McNally. 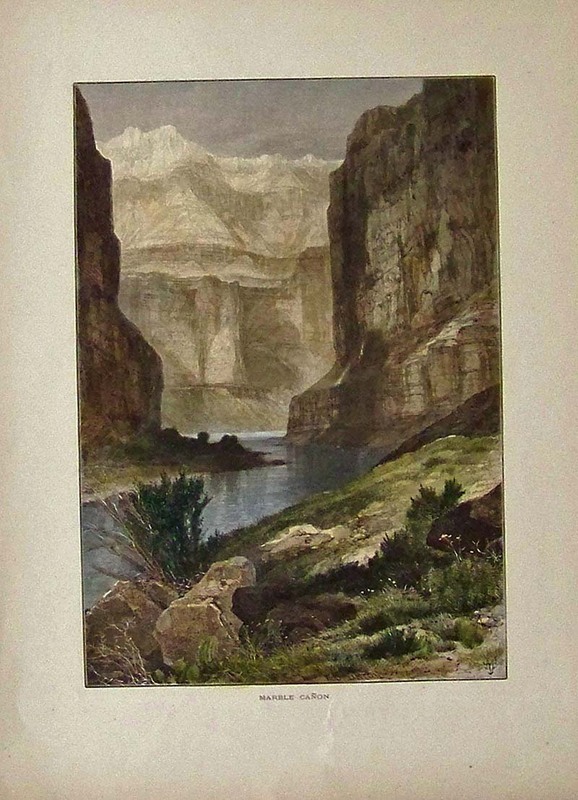 1880 Arizona & New Mexico published by Frank Gray in Gray's Atlas of the world. 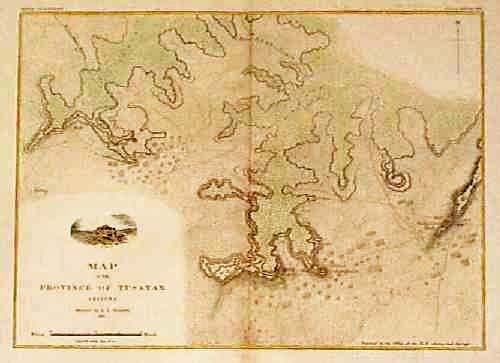 Original hand coloring makes this a very attractive early map suitable for framing. 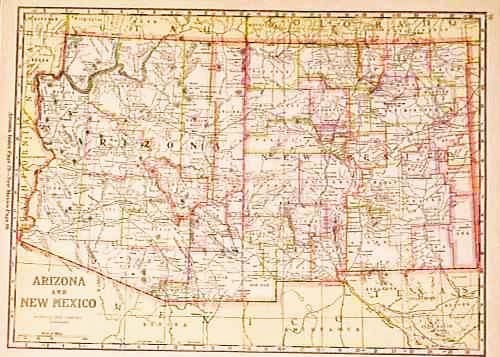 1894 Shall Arizona Be Admitted To Statehood? - Picturesque Bits Gathered By Our Representative in the Territory. 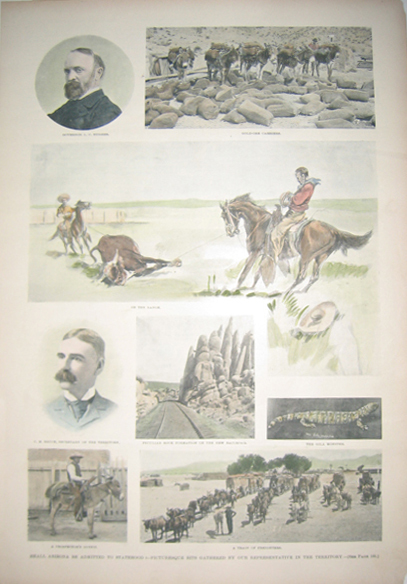 Eight hand colored half-tones depicting Governor L.C. 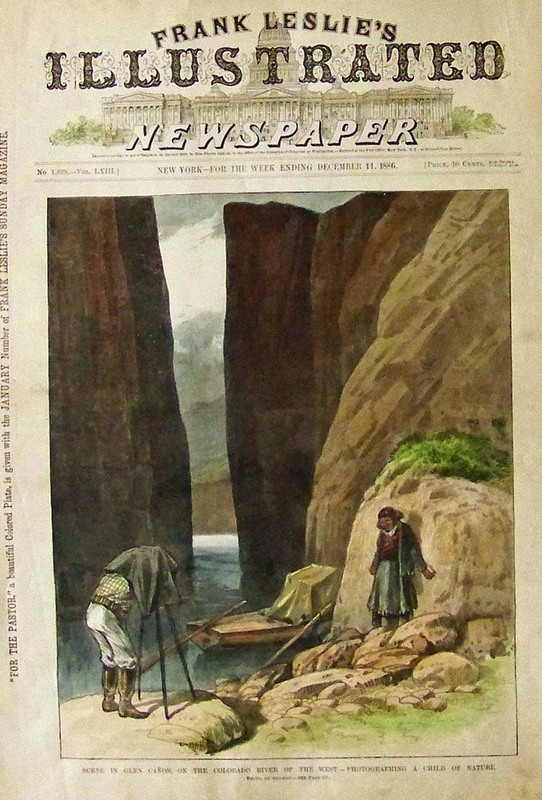 Hughes; gold-ore carriers; peculiar rock formation of the new railroad; C.M. 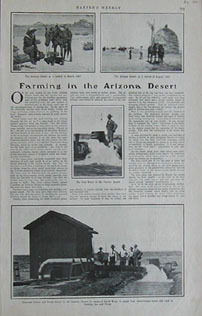 Bruce, Secretary of the Territory; A Prospector's Outfit; A Gila Monster; On the Range; and a Train of Freighters. C.1890 Hand colored photogravure showing the "Drug Department of the Detroit Copper Co. at Morenci" in Graham County, Arizona. 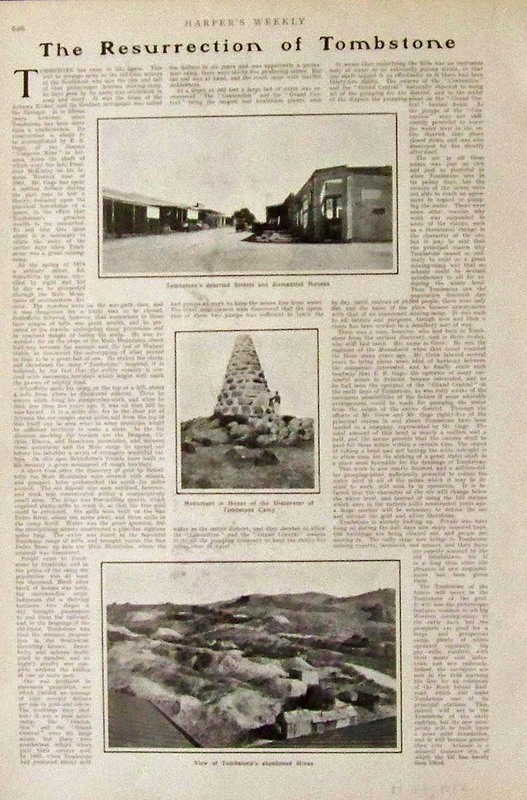 1902 Hand colored half-tones and article featured in Harper's Weekly titled, "The Resurrection of Tombstone," with images showing the old mining town of Tombstone's deserted Streets and dismantled Houses in top image, the Monument in Honor of the Discoverer of Tombstone Camp in middle image and on bottom, the View of Tombstone's adandoned Mines. 1900 George F. Cram hand colored, engraved Railroad Map of Arizona. 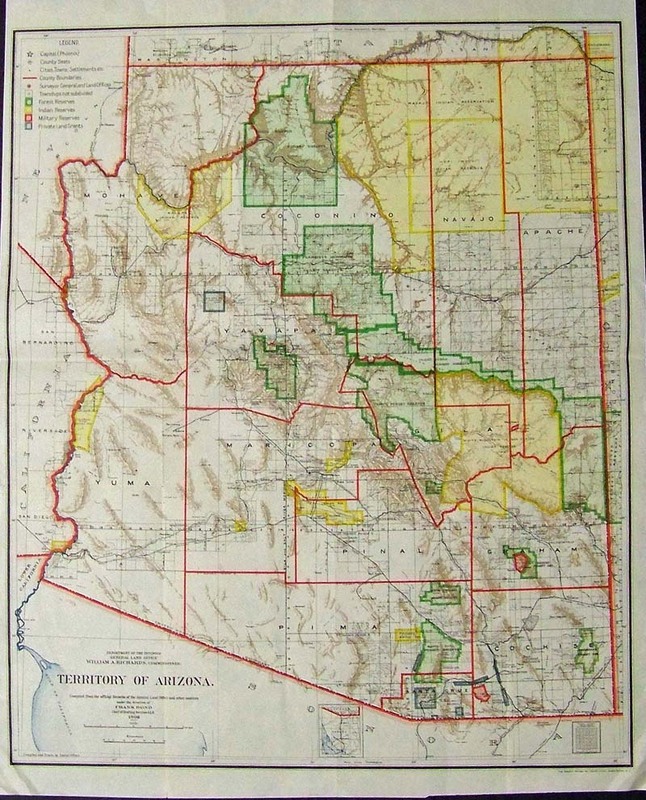 1882 Grand Canyon District map in color by the U.S. Geological Survey. Very large and attractive map with colors indicating various soil types. 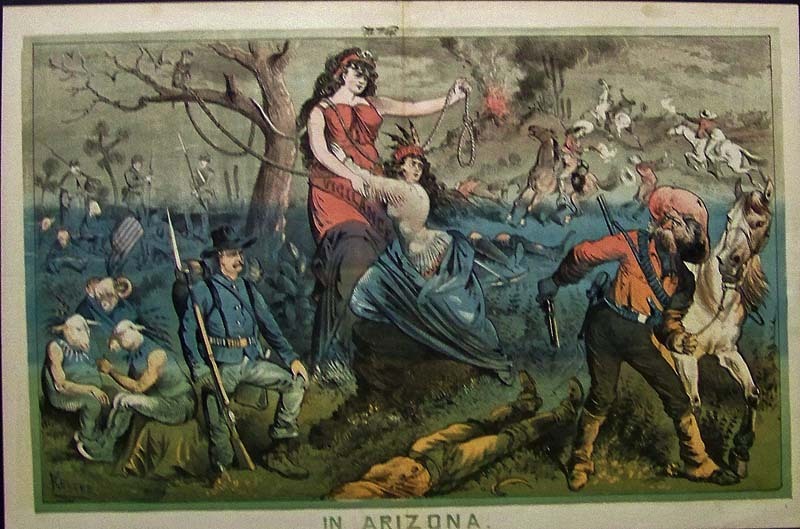 1889 Hand colored wood engraved image showing Arizona Buffalo Soldiers titled, "Cavalry in an Arizona Sand-Storm." Showing his best of the black Cavalry in the middle of an Arizona sandstorm.